The Goffs Vincent O’Brien National Stakes was first run in 1849, and it was originally called the National Produce Stakes and then the National Stakes. The inaugural running was won by Chatterbox. For a period the National Stakes was classed at Group 2 level, and it was promoted to Group 1 in 1985. It was extended from 7 furlongs to a mile in 1997, but its former distance was restored in 2000. The race became known as the Vincent O'Brien National Stakes in 2009, in memory of the successful trainer Vincent O'Brien (1917–2009). 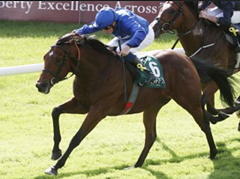 It reverted to its previous title in 2011 but was renamed the Vincent O'Brien Stakes in 2012. The National Stakes was formerly part of the Breeders' Cup Challenge series, with the winner earning an automatic invitation to compete in the Breeders' Cup Juvenile Turf. It was removed from the series in 2012.